Sauron built the Dark Tower of Barad-dÃ»r, Vader oversaw construction of a Death Star and a half, Bowser had seemingly endless castles and now you can have an evil lair, too! All you have to do is craft it. You do like building, right? 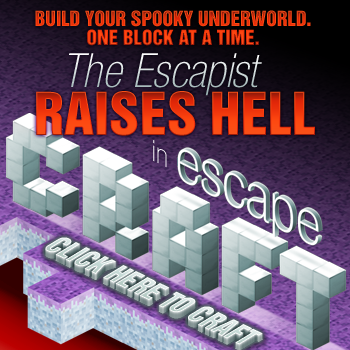 Starting presently, Escapecraft will be hosting their big, week-long Halloween build. In the coming days, contestants will pit their diligently honed building skills against one another in a competition of both willpower and imagination. Who will forge the mightiest ghostly stronghold? A year of Escapist Publisher's Club membership. This entails no ads, mobile access, high quality videos, entry into exclusive contests, a members-only forum, and much more. A month of Escapecraft Royalty Rank, typically reserved for notable donators. It comes with perks like a command for a /home, access to an exclusive sky world and a reserved plot of space. Top submissions will be showcased on The Escapist in an event highlights gallery.